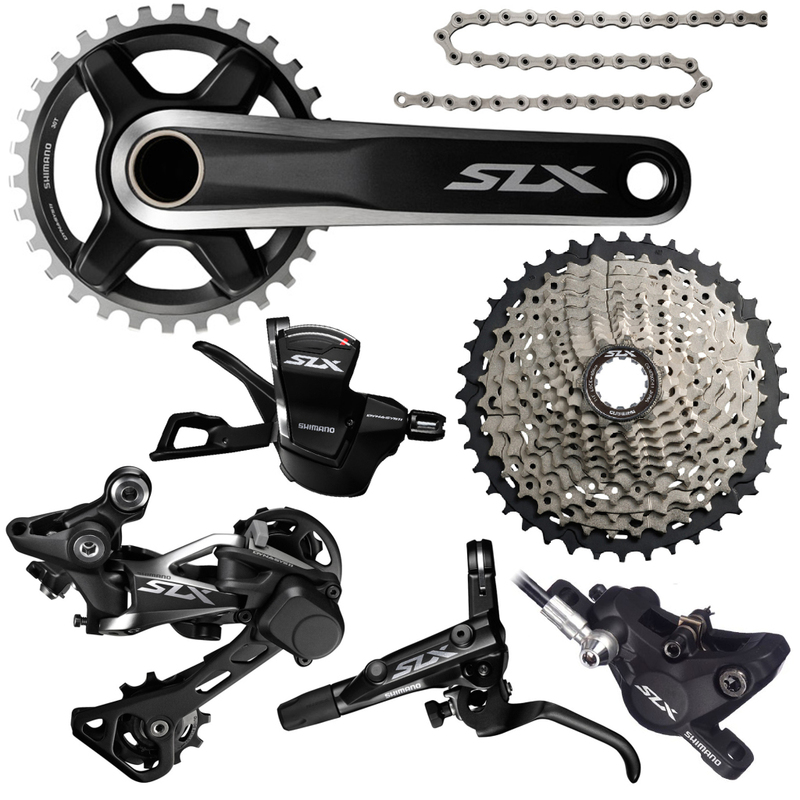 The New SLX M7000 11 speed groupset is developed with the same technology from Shimano’s XT and XTR 11 speed groupsets. The reliable Mid-range Shimano SLX is offered in a 1x11 speed drivetrain option making it easier and more affordable than ever to move to a single ring, modern 11 speed set-up. Please note: This is a fixed spec groupset. Incredibly well priced groupset. Affordable, robust and decent styling to boot. Perfect for my gravel set up, plenty of gear range and easy to set up. Brakes came bled out of the box and a tube shorten was a doddle with appropriate olives/barbs supplied. Not too heavy either on balance. Also delivered super quick by the guys at Merlin, thank you. Yes, it works flawlessly, but buyers should know that the rear shifter does NOT have the multi-cog downshift ability of the XT model. I find myself missing this feature because this group is 1x (my XT group is 2x) and there is more rear shifting involved in the riding experience. The shifting also feels a bit cheaper though the function of the gear changing is fine. I don't know why Shimano would not include this as it would constitute a miniscule increase in complexity. Merlin shipping was fast and all components were present. Excellent service and price. Thank you. As usual patience is a virtue & waiting just a little while brings you all the benefits of trickle down technology from the best in the business - Shimano. Factor in the amazing Merlin price & hey presto the equals a bargain beyond belief. Having already fitted a 1 x 11 XT groupset to another bike the only disadvantage of the SLX system is the weight of the rear derailleur. Don't let that put you off as it functions just as smooth as the XT. Making the jump from 2 x 10 to 1 X11 is a real no brainier, saving weight , tidying up your handle bar clutter & with it being Shimano it allows you to fit this system to everything from 9 (possibly 8 unconfirmed) through a 11 speed hub. Fantastic product, enough said. This groupset is so well made. It is comparable to the XT group from just a few years ago. Great value for a single chainring groupset. Wish the rotors were included. Upgrade from 3x9. Massive improvement and SLX very slick. Merlin fantastic to deal with, delivery to NZ was well packed and super fast and well priced on SALE!